I have found one of cinema's all time guilty pleasures. I almost chuckle in embarrassment when I tell people I dig this movie. If you looked up the term "screw loose" in the dictionary, there would be an image of its hyper kinetic poster front and center. This Dirty Dozen on steroids has got well known, respected actors hamming it up to no end. Its also got snappy, thoughtful, and witty dialogue which is something not normally found in a cheesy action flick. Finally, it has Nicolas Cage, letting the world know that hey, I already won an Oscar for Leaving Las Vegas (1996) and I can do whatever the heck I want. Cage plays army ranger Cameron Poe, a soon to be father who winds up in a federal prison over a bar fight. A drunk messes with his pregnant wife and Poe, using excessive force, accidentally commits murder. He is sentenced to eight years, gets out early for good behavior, and hitches a ride home on a plane full of convicts. Most of them are being transferred and are in the process of doing consecutive life sentences except for Poe. Once he gets off the plane, he is a free man. However, something happens and there is a hijacking by the criminal passengers on board, hence the title, Con Air. The unique thing about this late 90's exercise in ridiculousness is that despite its caffeinated, testosterone filled action sequences, we find serious actors (John Cusack, John Malkovich, and Steve Buscemi) striving hard to sell scenes that make you wanna take things seriously. I gotta admit though, it can be hard to embrace what's on screen. A lot of the material is less than plausible. I do however, applaud the effort. Basically this is one of those movies where you can forgive its shortcomings based on the likability of most of the characters. Let's face it, they may be nasty criminals but come on, they're a hoot. For instance, let's examine John Malkovich's character being a convicted murderer named "Cyrus the Virus." He becomes the leader of the hijackers. He spouts lines like, "and if you say a word about this over the radio, the next wings you'll see will belong to the flies buzzing over your rotting corpse." Ah, you gotta love a criminal mastermind who has multiple college doctorates and degrees. Then, you have Ving Rhames as "Diamond Dog," a character who writes a book in prison that may be made into a movie. Federal agent Larkin (Cusack) explains this and also reminds the audience that Denzel Washington is in talks to star. Ah Huh. 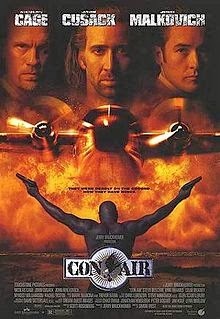 With Con Air, you have violent action scenes that have short set ups and even shorter payoffs. This is inter played with biting, sarcastic humor. Cage, almost mumbling his lines with a monumental five o'clock shadow, (I'm thinking he might have been paid per line) exhibits a fearless devil may care attitude because hey, he just wants to get home and embrace the daughter he has never seen before (I’m sure after seeing this flick, you'll probably wanna run out and buy this guy some razors stat). To end this review, I have a feeling that you will be entertained. Con Air's relentless zing factor will put you through the ringer and slap a big fat smile across your face. 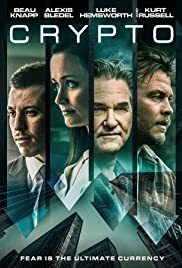 If you are looking for a ride this film is your ticket; not first class, but coach and that will do because ultimately you still get to your destination; uninhibited movie going bliss.